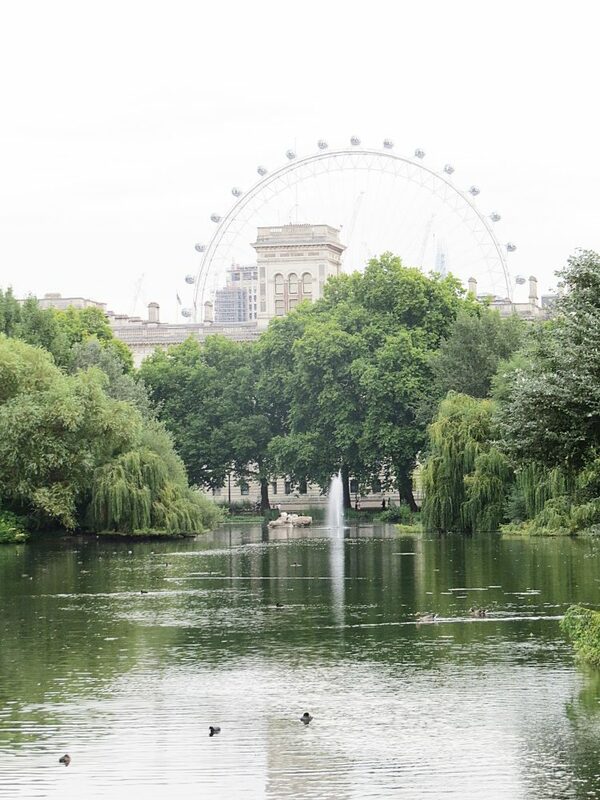 The remarkable thing about St James’s Park is not its undoubted charm but the fact that it has over five million visitors a year yet still looks fresh and well-kept, a tribute to the Royal Parks. The sense of tranquillity is marred only by the low steady hum of traffic on The Mall. Situated in the heart of tourist London with Buckingham Palace on one side and Trafalgar Square on the other, the great majority of those visitors are tourists finding some time for quiet calm in their overburdened tourist itineraries. The naturalistic lake, largely unchanged since the park was remodelled by John Nash in 1827 is the main feature and effectively divides the park in two. From the bridge across, there are good views to Buckingham Palace in one direction and the Foreign Office, Shard and the London Eye in the other. The north side is the more attractive, a landscape of undulating grassy banks set under a near continuous canopy of majestic mature plane trees and facing the lake. The lack of enclosure gives a sense of freedom, of being able to walk anywhere, reinforced by the haphazardly casual arrangement of deck chairs. 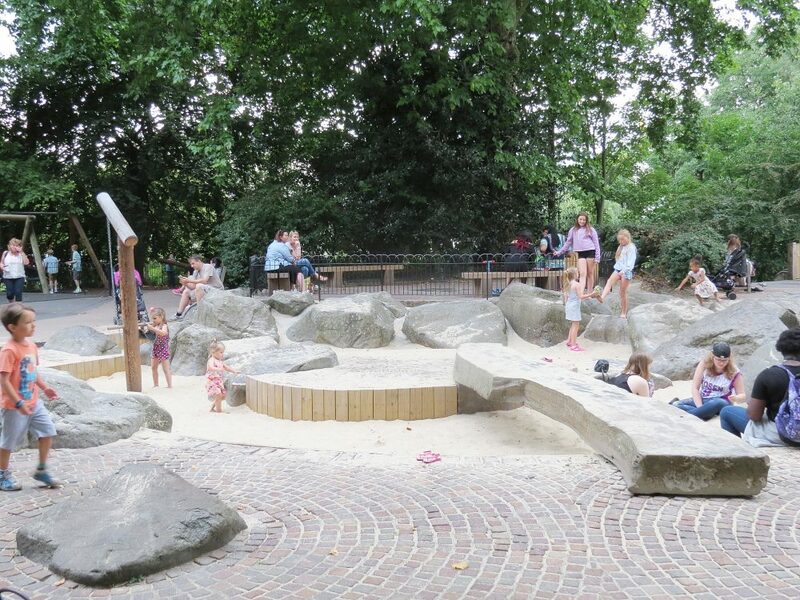 The south side does not seem as inviting as the views of the lake are interrupted by Duck Island, and the park benches face the early morning rather than the afternoon sun; but it does have a small, attractive and heavily-used children’s playground. In the 13th century the area was swampy meadows through which ran the River Tyburn on its way to join the Thames. Despite being close to the royal palace of Westminster the female leprosy hospital of St James’s was sited here, which gives the area its name. In the mid-15th century Henry VIII acquired the land and built the solid Tudor St James’s Palace and fenced off the adjacent marshland, woods and fields as a small royal hunting ground, used mostly for raising young deer that could then be moved to the larger neighbouring Hyde Park. The Tudors continued to use the park for hunting and pageants, but when James I came to the throne it became a menagerie for his camels, crocodiles and elephant. Down the south side of the park were aviaries of exotic birds, hence the name Birdcage Walk. The first ornamental park dates from the time of Charles II who, upon returning from exile in France in 1660, resolved to turn it into one of the newly fashionable pleasure grounds, the main features being a long wide canal, formal avenues of trees and shrubberies. Charles opened the park to the public for the first time and was seen mingling with his subjects and feeding the ducks, including the famous crane with a wooden leg. It was in the park that Charles held assignations with Nell Gynne, but over time the shrubberies became popular with the public for ‘impromptu acts of lewd lechery’. The east end of the park, where Horse Guards can be found today was a duck decoy, a series of interconnecting channels into which wild ducks were tempted into cages, only to find themselves shot, plucked, roasted and dressed for the king’s table. In 1664 the park acquired its first pelicans, a present from the Russian ambassador to Charles, who also introduced the game of pelle melle, played on fenced courts with mallets, balls and hoops, the sites of which give their names to The Mall and Pall Mall. The most ambitious piece of urban planning London has seen was undertaken by the Prince Regent (later George IV) in the early 19th century; the remodelled St James’s Park being the southernmost part of John Nash’s grand scheme that included Carlton Terrace, Regent’s Street, Park Crescent and Regent’s Park. 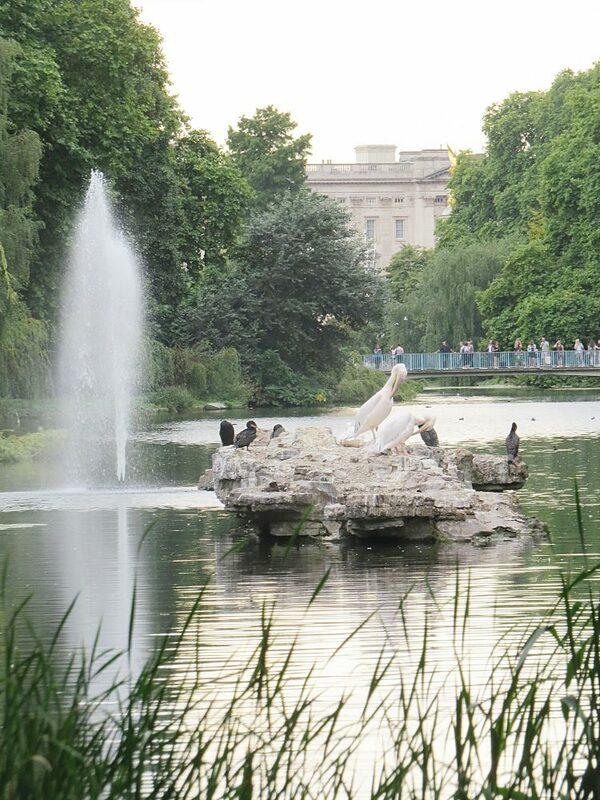 The main attraction of St James’s Park is not the twelve or so statues and monuments, largely ignored by the visitors but the collection of 30 species of water fowl. 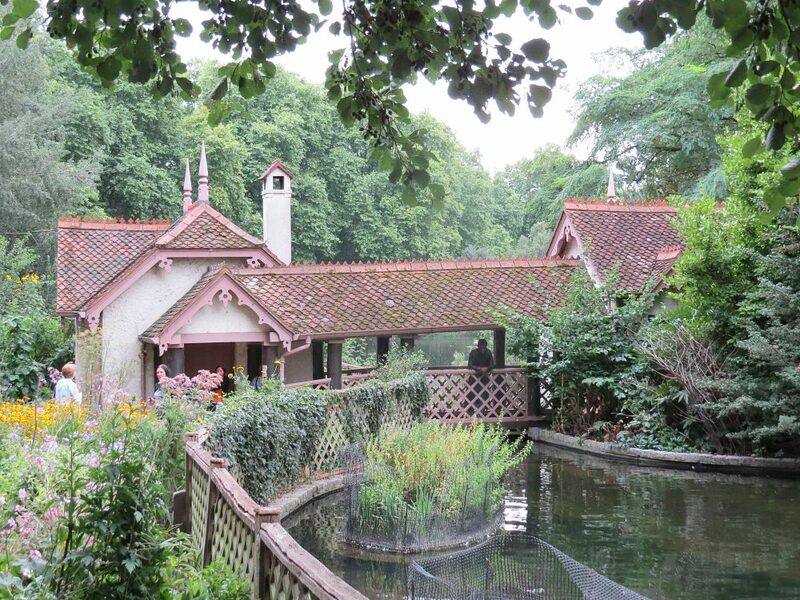 It was in 1837 that the Ornithological Society of London presented birds to the park, appointed a birdkeeper and built the whimsical Birdkeeper’s Cottage in the manner of a Swiss chalet. In addition to the famous pelicans and black swans are mallards, teal, tufted ducks, wigeons and many less common species. The concentration of waterfowl on such a small body of water requires careful water management including oxygenation helped by the water plumes of the Swire Fountain which rise to 8 metres (over 26 feet) and are illuminated in lurid changing colours in the evenings. In addition, there are reed beds which also provide cover and nesting sites for the waterfowl, and a water purification plant on Duck Island. 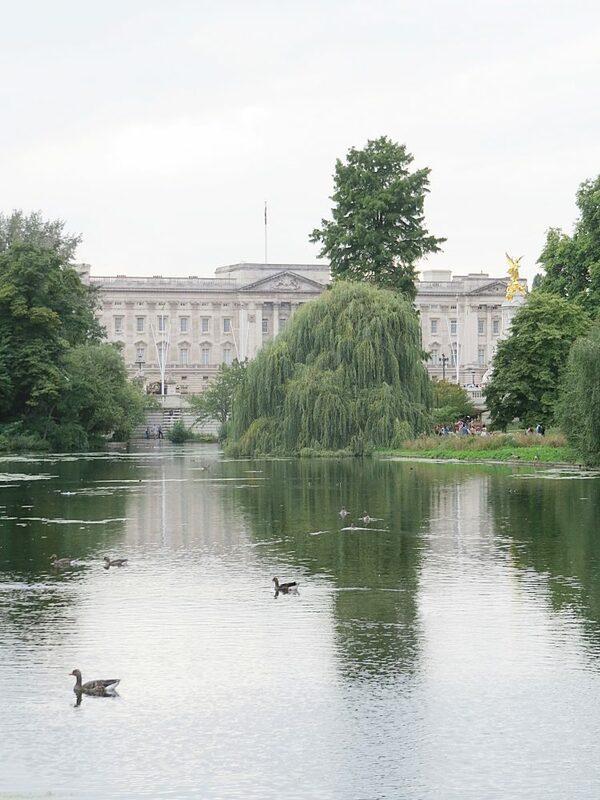 Perhaps not a landscape that garden visitors would normally be drawn to, St James’s Park seems to effortlessly cope with millions of visitors, delight them, and provide a much-needed quiet oasis. That in itself is something quite remarkable.